The Christmas countdown has already begun and it is an open secret that during this season, the smartphone brands are gearing up their new products for the gift giving days ahead, Cherry Mobile is no exemption, and by the looks of it in their leaked brochure, we are expecting at least 7 new devices under the Flare Premium series. 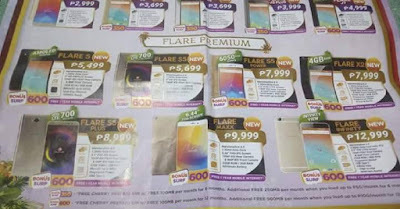 The Android phones listed are the Cherry Mobile Flare 5, Cherry Mobile Flare S5, Cherry Mobile Flare S5 Power, Cherry Mobile Flare X2, Cherry Mobile Flare S5 Plus, Cherry Mobile Flare MAXX and Cherry Mobile Flare Infinity, which cost as low as Php5,499 and as high as Php12,999. Each has its own unique feature, the Flare 5 has an AMOLED display, the Flare S5 and Flare S5 Plus are both LTE 700 ready, the Flare S5 Power comes with a huge 6,050mAh batter, the Flare X2 has 4GB of RAM, the Flare MAXX has a massive 6.44-inch screen and lastly, the Flare Infinity has something called "Infinity View" (don't ask us what it is, but rumors suggest it comes with border-less display). Our friend at GizGuide already removed their post about it, a thing they usually do when someone asked them to, which only leads us to believe that the leaked image is legitimate. We will update this post once we learn more information.